Cancer is one of the causes of death in Indonesia and even the world. Nuclear medicine techniques with radiopharmaceuticals and SPECT are one of the ways to treat cancer, but their use in Indonesia is not yet popular. Radiopharmaceuticals marked with radionuclide emitting beta (β) radiation are proven to be used for cancer therapy, one that has been developed in PTRR-BATAN is 90Y-EDTMP. Yttrium-90 is used in nuclear medicine by utilizing β radiation (E max 2.28 MeV). The β energy which is produced from the decay process of 90Y radionuclides to 90Zr can kill cancer cells. This study aimed to provide information about the substances biological effects so that preventive measures can be taken to protect humans. This study conducted evaluation of the 90Y-marked radiopharmaceutical (90Y produced from a 90Sr / 90Y generator which is 90Y-EDTMP) encompasses clearance test, pyrogen test, and dose safety test in experimental animals. The clearance test utilized mice, the pyrogen test utilized rabbits, and the dose safety test utilized mice. The results of the clearance test showed that 90Y-EDTMP compound which was excreted in 192 hour was 49.70% through urine and 14.59% through feces. The total excretion of 90Y-EDTMP within 192 hours was 64.57%. Based on the results of clearance tests with calculations, 90Y of 90Sr / 90Y generators in 90Y-EDTMP dosage form had 84.2 hours of half-life, 36.5 hours of an effective half-life and 52.7 hours of a residence time. Pyrogen test results showed pyrogen-free. The 90Y-EDTMP dose safety test showed that the dose is safe and not deadly. The development of 90Y-EDTMP is expected to be improved to produce radiopharmaceuticals for cancer therapy in order to make a real contribution in public health services. 1. Sohaib M, Ahmad M, Jehangir M, Perveen A. Ethylene diamine tetramethylene phosphonic acid labeled with various beta(-)-emitting radiometals: labeling optimization and animal biodistribution. Cancer Biotherapy and. Radiopharmaceutical. 2011;26(2):159–64. 2. Chakravarty R, Pandey U, Manolkar RB, Dash A, Venkatesh M, Pillai MRA. Development of an electrochemical 90Sr-90Y generator for separation of 90Y suitable for targeted therapy. Nuclear Medicine and Biology. 2008;35(2):245–53. 3. Petrovic D, Nikolic N, Stankovic D, Djokic D. Electrochemical separation of 90-Yttrium in the electrochemical 90Sr/90Y generator and its use for radiolabelling of DOTA-conjugated somatostatin analog [DOTA0, Tyr3] octreotate. Nuclear Technology & Radiation Protection. 2012;27(3):260–8. 4. Sulaiman, Aguswarini S, Karyadi, Chairuman, Setiawan G, Subur M, et al. Uji biodistribusi senyawa 90Y-sitrat dan 90Y-EDTMP yang ditandai dengan 90Y hasil elusi dari generator 90Sr/90Y. Prosiding Pertemuan Ilmiah Tahunan Perhimpunan Kedokteran Nuklir Indonesia (PKNI), Perhimpunan Kedokteran dan Biologi Nuklir Indonesia (PKBNI), dan Pusat Teknologi Radioisotop dan Radiofarmaka (PTRR); 2015. p. 1–8. 5. Pandey U, Kameswaran M, Subramanian S, Chakrafarty R, Sarma HD, Samuel G, et al. Development of Radiopharmaceuticals Based on 188Re and 90Y for Radionuclide Therapy at Barc. In IAEA radioisotopes and radiopharmaceuticals series, no. 5. Yttrium-90 and Rhenium-188 radiopharmaceuticals for radionuclide therapy; 2015; Vienna, Austria. IAEA; 2015. p. 82–106. 6. Sulaiman, Aguswarini S, Karyadi, Chairuman, Setiawan G, Subur M, et al. Optimasi penggunaan HCl sebagai larutan pengelusi. Urania. 2015;21(2):87–94. 7. Ramli M, Hidayat B, Aguswarini S, Karyadi, Ardiyatno CN, Subur M., et al. Preclinical study of 177Lu-DOTA-trastuzumab: a potential radiopharmaceutical for therapy of breast cancer postive HER-2. 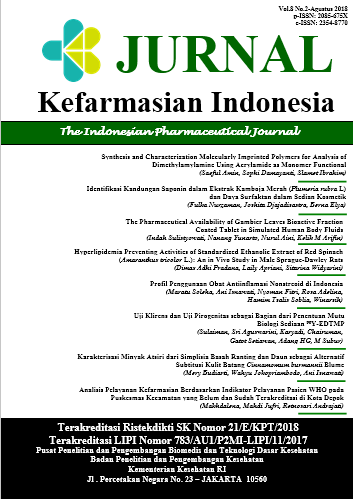 Jurnal Ilmu Kefarmasian Indonesia. 2013;11(2): 116-22. 8. Khalid M, Bokhari TH, Ahmad M, Bhatti HN, Iqbal M, Ghaffar A, et al. Evaluation of carrier added and no carrier added 90Y-EDTMP as bone seeking therapeutic radiopharmaceutical. Pakistan Journal of Pharmaceutical Sciences. 2014;27(4):813–8. 10. Hardi A, Rista S, Mutalib A, Sugiharto Y, Dini R, Aguswarini S. Preparasi, biodistribusi dan clearance senyawa pengkontras MRI Gd-DTPA-PAMAM G4-NIMOTUZUMAB melalui simulasi menggunakan 153Gd-DTPA-PAMAM G4-NIMOTUZUMAB. Seminar Nasional VI SDM Teknologi Nuklir; 2010 November 18; Yogyakarta, Indonesia. 11. Parasuraman S. Toxicological screening. Journal of Pharmacology & Pharmacotherapeutics. 2011;2(2):74–9. 12.	International Pharmacopoeia. 5th ed. Geneva: World Health Organization; 2015. 13. Ranjbar H, Samani AB, Beiki D, Arani SS, Maragheh MG. Evaluation of 153 Sm /177 Lu-EDTMP mixture in wild-type rodents as a novel combined palliative treatment of bone pain agent. Journal of Radioanalytical and Nuclear Chemistry. 2015;303:71–9. 14. Samani AB, Maragheh MG, Jalilian AR, Meftahi M, Arani SS, Moradkhani S. Production, quality control and biological evaluation of Sm-EDTMP in wild-type rodents. Iranian Journal of Nuclear Medicine. 2009;17(2):12–9.